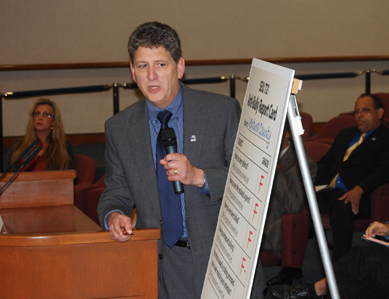 Armed with results from nearly 500 Workplace Bullying surveys, members presented a large report card, rating the County on key bullying activities during a Ventura County Supervisors meeting on Sept. 27, 2011. Members also provided the Board with a a comprehensive report analyzing the survey data and calling for five specific recommendations including the adoption of an Anti-Bullying policy, providing mandatory training for managers and supervisors, and the creation of an independent third party entity to field reports of workplace bullying. Members also shared personal experiences working under bullying managers and supervisors. “Everything he did was designed to make our department less efficient and less effective. Every day was like walking onto a battlefield,” said Emmett Faulconer, Supervisor of a Biomedical Department. It should be noted that this Workplace Bullying campaign is on the cutting edge. Much of the recent focus has been on teen bullying in middle and high schools. But just as the Ventura Grand Jury observed, there is a lot of work to do in County governments to create a bully-free workplace. This campaign intends to push the envelope and increase awareness of workplace bullying as the Board is urged to adopt these new policies. Does your workplace need an anti-bullying policy to help improve the efficiency and effectiveness of your workplace? Let us know. Some scenes from the Board of Supervisors Meeting event. Recently I had a client who was a young man with disabilities. He worked for a retail location in a janitorial role. He loved his job and everyone he worked with. Unfortunately he was the victim of workplace bullying and was made to work obscene hours tirelessly. He did so with a smile because he truly loved the company. Unfortunately this led him to neglect warning signs about his own health and when he brought them to the attention of his shift supervisors he was told to go back to work. Later he ended up passing out on the floor, being hospitalized, and later passing away. All this because bully supervisors took advantage of him. We need to recognize not only when this is happening to ourselves, but to those around us who cannot intercede on their own behalf.